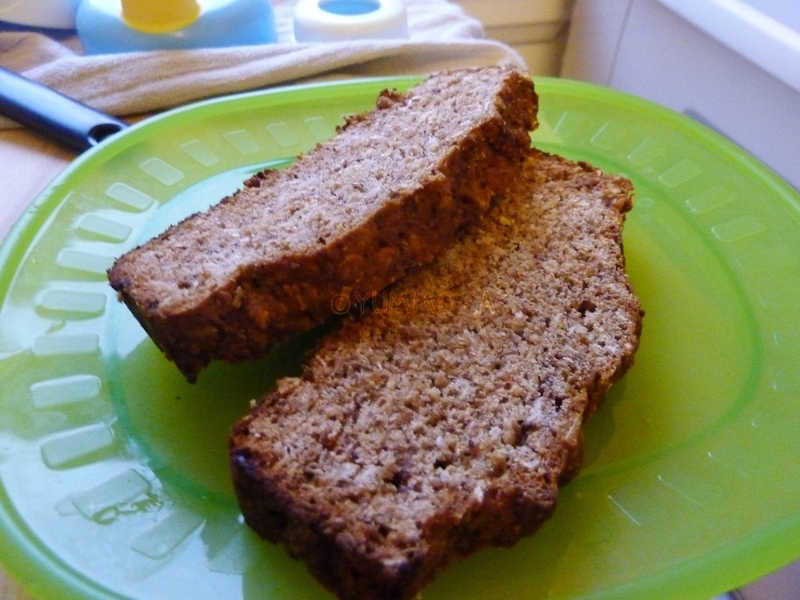 Baby Banana Bread - No Egg, No Oil, No Sugar - All Moistness and Flavour! I've wanted to make lil T his own baked goods where I didn't have to worry about the ingredients. He's had baked goods outside the house. His daycare offers him homemade baked goods and in a pinch, outside he may get a slice of Banana Bread or Croissant. If I had it my way, he would only eat baked goods I could be sure what went into it. I can't obviously but I can try to insure that the bulk of what he eats meets that aspiration. I do not have an issue with Eggs but I forgot to buy them when I went shopping so I thought I'd give it a go. It was a tad dense but with the Bananas, it was still very moist and lil T loved it. He ate his slice for breakfast and went after D's and when I woke up an hour later (weekends, I sleep in) he grabbed a chunk of mine. It was very tastey even for grown ups. Lightly Oil a regular loaf pan but if you're confident on your non-stick, you may not need it at all. We have quite nice Cafalon and they still stick. In a large bowl, mash the Bananas. Add the Salt, Coconut, Cinnamon, Nutmeg and Honey. Mix thoroughly. In a small bowl, mix the Flour, Baking Powder and Oatmeal with a fork. In a small prep bowl, add 1/4 c Water and the Baking Soda, stir. Add the Dry to the Wets and mix with a large wooden spoon or rubber spatula a handful of turns. This will be a very stiff batter, softer than Bread dough but stiffer than Muffin batter. If it is too dry add a couple of T of Water. Do not over mix though because you don't want a tough bread and since there are no Eggs or Oil, you risk that. Place the dough into the pan and press out to the corners. Bake for 40-45 minutes in the middle of the oven. Baby Carrot Cake and Zucchini Bread is next.